Hungarian Prime Minister Viktor Orbán speaks during Hungary’s National Day celebrations. During the refugee crisis in 2015, Hungarian Prime Minister Viktor Orbán sealed off Hungary’s borders. Despite European Union-wide criticism, he refused to change his course and cooperate with the EU. His campaign against the EU’s migration-friendly policy has led to the suspension of his Fidesz Party from the European People’s Party (epp), effective March 20. The epp is the EU’s largest and most powerful party grouping, a coalition of Christian parties. While Orbán believes that he represents these Christian values best, his view stands in stark contrast to those of his epp colleagues. Orbán, in fact, claims to be the only one still fighting for Christian Europe. In his anti-EU campaign, Orbán promoted a billboard campaign throughout Hungary that blamed the EU leadership for destroying Europe through its migrant-friendly policies. He also accused EU Commissioner Jean-Claude Juncker and United States billionaire George Soros of flooding the EU with migrants. Facing threats of an exclusion from the epp, Orbán dropped the campaign and apologized for possibly insulting epp partners. But his apologies were to no avail. According to an epp spokesman, party members voted to suspend the Fidesz 190-3. Following the epp’s vote, Orbán decided the Fidesz Party would suspend itself from the epp. A statement later announced that the suspension was a joint decision by the Fidesz and epp. Orbán said it was “not possible to expel or to suspend us; we have won four elections, so we decided to suspend ourselves unilaterally.” He said that his party would continue to support the epp’s leading candidate, Manfred Weber, in his campaign to become the next European Commission president. EU elections are scheduled to be held in May. The epp wants to demonstrate a united front to gain support from a majority of EU citizens. Many feared that Orbán’s extreme views on migration would hinder a successful EU campaign. Furthermore, many in the EU leadership believe that Orbán’s stance, though popular with millions of EU citizens, has to be opposed since it contradicts the epp’s Christian Democratic values. Hungary under Orbán has developed into Europe’s most anti-migrant country. Critics present Orbán as a populist, anti-Semitic dictator. The United Nations human rights chief called him a racist. Others portray him as a political outcast who opposes all that liberal democracy stands for. The problem is that the “dictator” is very popular in his own country and notable Jews speak favorably of him. Even Israeli Prime Minister Benjamin Netanyahu seeks his cooperation. Orbán enjoys the support of the people while at the same time opposing EU policies. Many are afraid that leaders like Orbán will make a united Europe impossible. Orbán is convinced that he is fighting not against but for a united Europe. However, he believes that Europe can only unite through Christianity. Orbán might be seen as a problem today, but time will prove him to be more of a forerunner than an outsider. Orbán, Defender of Christian Europe? In an interview with Switzerland’s Weltwoche, Orbán explained that Europe is currently facing an “existential threat” because “we Europeans have forgotten how to fight for ourselves.” He added, “Whenever I speak of Christian Europe in the European Council, the others look at me as if I were from the Middle Ages” (Trumpet translation throughout). In the Middle Ages, Europe united by forming a church-state combine called the Holy Roman Empire. Though rejected by modern European secular leaders, this has historically been the only solution to European unity. Orbán believes that Europe must return to these roots. “We are working on building an old-school Christian democracy, rooted in European traditions,” he said just following Hungary’s national election in April. Using Bible prophecy, the late theologian Herbert W. Armstrong foretold the end result of this power struggle. “I have been proclaiming and writing ever since 1935 that the final one of the seven eras of the Holy Roman Empire is coming in our generation—a ‘United States of Europe,’ combining 10 nations or groups of nations in Europe—with a union of church and state!” he wrote in the January 1979 issue of the Plain Truth newsmagazine. While the EU currently consists of 28 member states, Daniel 2 and Revelation 17 clearly show that its membership will be reduced to 10 nations or groups of nations. A main reason so many nations will be excluded from the Union, or will leave it voluntarily, is because they will not accept the reemergence of rule by the Roman Catholic Church. The Bible prophesies that this union will lead a war against radical Islam in the Middle East (Daniel 11:40) and reinstitute mandatory religious worship on the European continent (Revelation 13). Indications are that Hungary will be part of these unified 10 nations. Orbán is laying the groundwork for the fulfillment of this prophecy. “One thing you can count on,” the Plain Truth declared in September 1967. “In fact it is so sure you can bank on it: The cry of a political union in Europe will get louder.” In April 1952, Mr. Armstrong’s Good News magazine wrote: “Russia may give East Germany back to the Germans and will be forced to relinquish her control over Hungary, Czechoslovakia and parts of Austria” in order to complete this union. Our free booklet He Was Right explains that Mr. Armstrong forecast in detail that the Soviet Union would lose its power over Eastern Europe. Mr. Armstrong specifically stated that this would largely be due to the Catholic influence in these countries. As our booklet explains, Mr. Armstrong foretold that once these countries break away from Russia, they would seek a closer cooperation with Christian Europe. Since the collapse of the Soviet Union in 1990, Russia has lost much of its influence over Hungary. And under Orbán, the country has continued to return to its Christian roots, exactly as Mr. Armstrong prophesied would happen. In close cooperation with the Catholic and Calvinist Church in Hungary, Orbán has largely revived the Holy Roman Empire in his country. Among other things, he reversed the trend of the secularization of Hungarian’s educational system and handed the schools back over to the churches. Instead of allowing the spread of Muslim communities, he promotes Christian education in schools and the upholding of Christian values in society. He also fights against the persecution of Christians in the Middle East. In a country that is predominantly populated by Roman Catholics and Calvinists, Orbán’s policies speak to the Hungarian people. 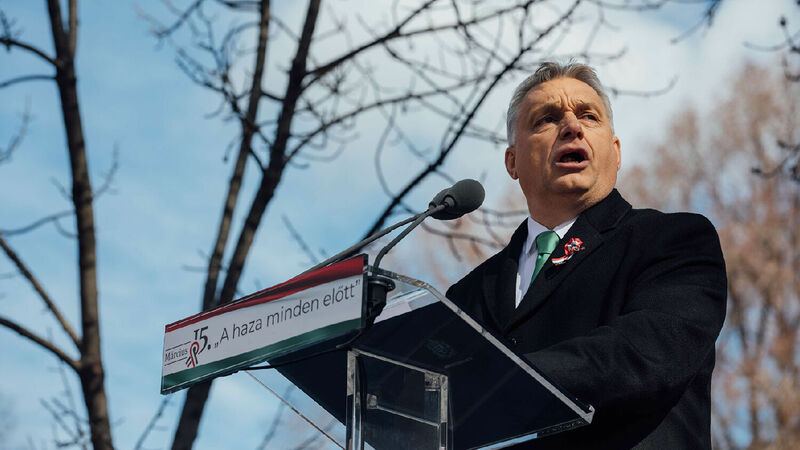 Though rejected by Europe’s elites, Orbán’s policies and rhetoric resonate with leaders in political parties in various countries throughout Europe. Most governments in Eastern Europe support Orbán’s position. Germany’s Christian Social Union has never been hesitant to hide the fact that it has more in common with Orbán’s policies on migration than those of Chancellor Angela Merkel. Italian Prime Minister Giuseppe Conte and Austrian Chancellor Sebastian Kurz have also promoted a similar anti-migration policy. Revelation 17 shows that the last resurrection of the Holy Roman Empire will be led by 10 powerful kings with one overarching emperor, empowered by the Roman Catholic Church. If Orbán wants to be part of that union, he will have to submit to that prophesied overarching emperor and the Roman Catholic Church. Orbán professes to be a Calvinist, accepting neither the leadership of Pope Francis nor the EU. But this could change. Orbán knows he must cooperate with the Catholic Church and the EU in order to attain some of his goals. Indications are that a change in leadership at the top of these institutions would enable him to submit more fully to their authority. Our free booklet Daniel Unlocks Revelation, by Trumpet editor in chief Gerald Flurry, explains how other European leaders will come to the same realization. Today it seems as if Hungary under Orbán will be excluded from the European Union because of its anti-Muslim and pro-Christian policies. But prophecy foretells that 10 nations will follow a similar route that Hungary is taking today. Though these nations will have various differences and disagreements, they will ally themselves for a short time to cause great destruction in the world. Today, Europe appears ready to fracture over this controversy. Hungary, which only a few decades ago was under Soviet rule, is today one of the chief promoters of this prophesied Holy Roman Empire. Other nations are taking a similar route. Mr. Armstrong prophesied that all these events would come to pass. To understand how he knew these events would happen, request your free copy of our booklet He Was Right.